Each spring 1000's of Environmentally concerned volunteers who care about the Thames River and tributaries converge all along the watershed to clean up garbage and debris that is harmful to wildlife and water quality. With the generous support of our sponsors and community partners each volunteer is supplied with gloves, garbage bags, a promotional gift, and a ballot to win a Nova Craft canoe. Volunteers have noticed the Thames River is much cleaner and healthier in part to all their efforts over the years. 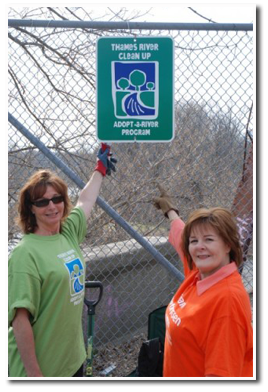 Volunteers and Sponsors have dedicated their stewardship to specific sections and "Adopted" them as part of the "Adopt a River" program. Public awareness and education is key to preserving our Canadian Heritage River for future generations.